Built in 1861 Chicago, Camp Douglas was the largest Union Army prisoner-of-war camp for Confederate soldiers taken prisoner during the American Civil War. The book was written from the 19th Century mind-set and 20/20 hind sight. Camp life is told through the diaries, journals, and letters of prisoners from the camp. It was described as “80 acres of hell”. Don’t miss this compelling story. David Keller is a long time resident of Chicago and an amateur historian. Retired since 2002, he devotes much of his time to volunteer activities including the Lincoln Park Zoo, Chicago History Museum and American Youth Soccer Organization. David’s interest in Camp Douglas comes from his interest in the Civil War, Civil War Prison Camps and 19th century Chicago history. The founder of the Camp Douglas Restoration Foundation http://www.campdouglas.org/, Mr. Keller is in demand as a speaker on the Civil War and Camp Douglas and has written two books, The Story of Camp Douglas, Chicago’s Forgotten Civil War Prison and Robert Anderson Bagby, Civil War Diary (Annotated) 1863-1865. Does Your Mapping App Have A Setting For 1872? Chicago property records are a superb place to find family history data. In those records, a researcher can find information about when a family member purchased property, the economic condition of the family, legal actions concerning the family, sales to, possibly, other family members, pre-1917 death information (filing of probates), and, occasionally, evidence of criminal activity. Those interested in researching such records from after 1871 can find the “grantor-grantee” (seller-buyer) records at the office of the Cook County Recorder of Deeds. (Chicago Public Library, 4th floor) or an older property atlas. A magnificent property atlas of Chicago in 1872 is now readily available for at home researchers of Chicago and Chicago family history researchers. Following the destruction of Chicago property records (with the exception of those held by the Chicago Title Company) by the 1871 Chicago Fire, a good mapping of city property lines was sorely needed. Otto Peltzer, a German immigrant who came to Chicago in 1853 and, beginning as a draftsman in the Cook County Recorder’s Office, rose to become Chief of Maps at the Recorder’s office between 1860 and 1876, decided to use his own personal collection of data to produce those much needed maps. The result of his work was the “PELTZER’S ATLAS OF THE CITY OF CHICAGO” which he published in 1872. This set contains beautifully done maps showing each piece of property in the city, as well as lot numbers, subdivision legal descriptions, and exquisitely drawn maps of all of the parks in the city. The maps in the set show all streets and alleys using the NAMES OF THE STREETS AS THEY WERE NAMED IN 1872! Railroads and station sites are also drawn on the maps. A “World Cat” search brings up only three sites where this atlas set can be viewed: the Newberry Library, the University of Illinois Chicago, and the University of Illinois Champaign. Peltzer ordered the printing of only 100 copies of his atlas set (selling in 1872 for $400 each or about $8,000 today). They are an extremely rare atlas set. The Chicago & North Western (Railroad) Historical Society owned a set of those maps but had them auctioned off to help with the raising funds for an enlarged and permanent C&NW Historical Society railroad archives on the property of the Illinois Railway Museum in Union, IL. The staff at the archives of the Chicago & North Western Historical Society (www.cnwhs.org) scanned all the pages in each of the four volumes before sending the set to auction. For those with a strong interest in Chicago history and genealogy, a copy of this atlas is an essential part of one’s Chicago collection. 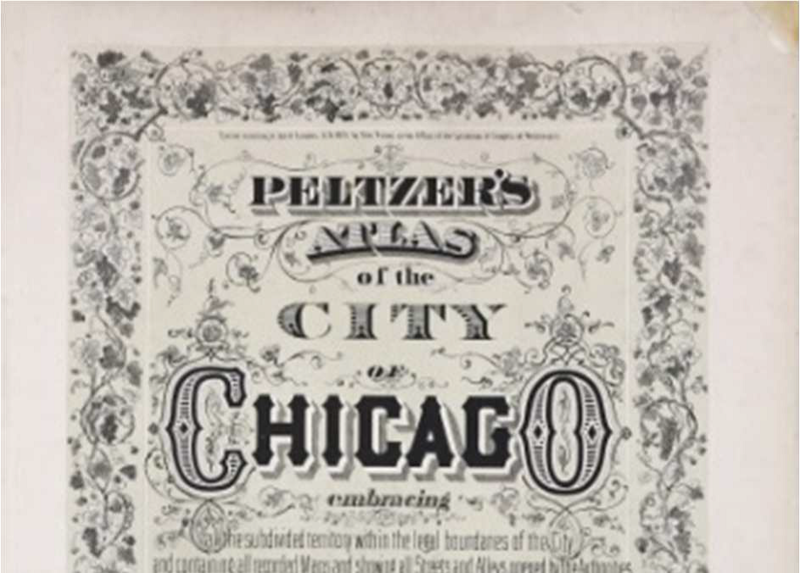 The Chicago & North Western Historical Society is selling a disc containing all four volumes of the Peltzer atlas.